"In the ever–evolving world of search marketing it is often the case that, as the old adage says, knowledge is power." Google updates their search algorithm roughly 500-600 times every year, and although the major updates are regularly discussed in the Search Marketing community, keeping a track of all the changes can nonetheless be a difficult task. Given the impact of Panda and Penguin penalties in the world of search since these two angry Google animals have made their debut, it makes sense to keep an eye on what’s happening in the search results. Fortunately, there are numerous resources, tools and websites to help any Search professional discover this kind of information with ease. Much as they sometimes look like it, the way these online tools work is actually less arcane than one might think; in the main they operate by taking a mix of keywords (the amount varies from site to site) from the search engines, then measuring the rankings for those keywords and tracking any major shifts in how the results are ranked. It’s always a good idea to use several of these to account for different data sets, software coding and internal algorithms, so that you have the best overall picture of what’s occurring in the search results at any given time. Tracking both Google and yahoo volatility, the Serps.com volatility checker checks around 1000 domains and shows them against a horizontal line representing a30-day average, with spikes and dips representing changing results or lack thereof. 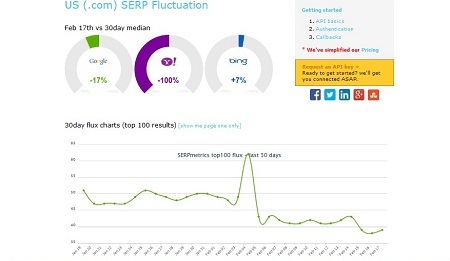 Helpfully comparing the 3 biggest search engines, Google, Yahoo and Bing, Serpmetrics shows a percentage compared against median 30-day average. Another helpful data aggregator, the AWR Google algorithm changes table records SERP positions, specifically overall ratings, or the top 50, 20 or 10 results. This can be tracked over a period up to 6 months historically, and it also has the ability to track .co.uk and .de (Germany) positions, something not offered by other tools. The MOZ algorithm update chart A thorough, detailed and up-to date history of Google’s major algorithmic changes by Moz,which is very helpful to give beginners an overview of the current state of search and is well worth a read even if you’re not new to SEO. One of the most famous of the blog aggregators, the SEO and marketing-specific section of Alltop gathers data from dozens of feeds from an assortment of SEO, Marketing and Web optimisation blogs and presents a summary of each of their 5 latest posts on its own page, providing plenty of up-to date reading material. For those wishing to create their own list of blog feeds, the excellent feedly allows you to search for blogs and topics and organise them into collections and categories for easy reading. The previews are simple and effective, making reading a breeze. The blog of well-respected SEO reporter Barry Schwartz, Seroundtable is well worth checking into every few days-Barry updates his news stories almost daily and acquires his information from a variety of sources,including industry insiders, twitter and Google+, other blogs, and unusually for an SEO news blog also tracks trending conversations and threads on various Search Marketing forums. These include the Webmasterworld forum, Cre8asite forums, and Google’s Webmaster help forum. As a result, the stories he reports on are usually hot off the press. In review, although it is a good idea to take the data that these tools and resources provided with a pinch of salt, and to rely first and foremost on one’s own experiences and testing, they can still be a good way to get hold of aggregate data on the current state of the search results to gain a broad overview of them.